Official letter for appointing a b17 grade officer in local govt office. He is General accountant before. Letter should be in the name of secretory of province. Requisition for appointing B 17 officer Notification sample. I am writing this letter to inform you that Mr. Hunter Morrison is being appointed to the post of Jr. Clerk in Municipal Office. He has passed the written test and interview and was the only person who met the standards set by the jury. He was general accountant in a private organization. So according to the directions of Mayer of the state, Mr. Morrison be immediately given the charge of Jr. Clerk in the former mentioned office with effect from 3rd June, 2016. We are looking forward to immediate response. It gives me great pleasure to inform you that you have been selected to be appointed as Assistant Accounts Officer in this organization. Your job responsibilities include: Maintaining individual accounts, preparing bank reconciliation statement, maintaining tax record and working in collaboration with the Senior Accountant in preparing annual financial statements. You will report to the Accounts Manager. You will be given a gross salary of $4500 per month in addition to pension and medical facilities. You will have to work for 7 hours a day, from Monday to Friday. Kindly, confirm your appointment by joining the office from Monday. I hope that you will turn out to be a great asset for our team. 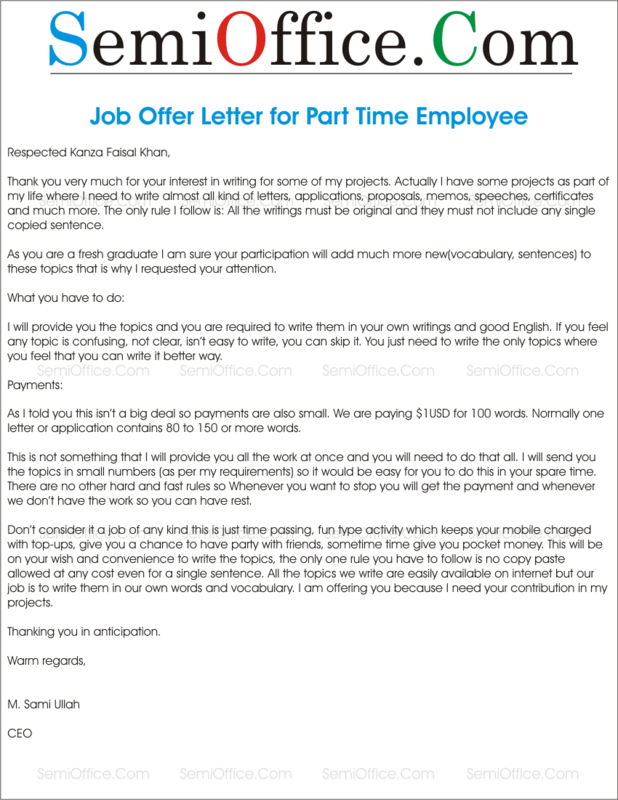 Sample Job offer letter for part time employment or part time job to hire new employees for your office, school, business, factory or company. Thank you very much for your interest in writing for some of my projects. Actually I have some projects as part of my life where I need to write almost all kind of letters, applications, proposals, memos, speeches, certificates and much more. The only rule I follow is: All the writings must be original and they must not include any single copied sentence. As you are a fresh graduate I am sure your participation will add much more new(vocabulary, sentences) to these topics that is why I requested your attention. I will provide you the topics and you are required to write them in your own writings and good English. If you feel any topic is confusing, not clear, isn’t easy to write, you can skip it. You just need to write the only topics where you feel that you can write it better way. As I told you this isn’t a big deal so payments are also small. We are paying $1USD for 100 words. Normally one letter or application contains 80 to 150 or more words. This is not something that I will provide you all the work at once and you will need to do that all. I will send you the topics in small numbers (as per my requirements) so it would be easy for you to do this in your spare time. There are no other hard and fast rules so Whenever you want to stop you will get the payment and whenever we don’t have the work so you can have rest. Don’t consider it a job of any kind this is just time passing, fun type activity which keeps your mobile charged with top-ups, give you a chance to have party with friends, sometime time give you pocket money. This will be on your wish and convenience to write the topics, the only one rule you have to follow is no copy paste allowed at any cost even for a single sentence. All the topics we write are easily available on internet but our job is to write them in our own words and vocabulary. I am offering you because I need your contribution in my projects. 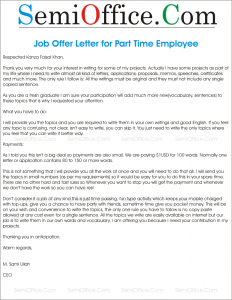 Sample Job Offer Letter for hiring employees on permanent basis or contract basis. I am very pleased to refer to the job application submitted by you for the job as an English teacher in our institution which has been considered and you have been selected for this post. You are therefore advised to visit our office along with your original academic qualification and experience certificates at 10.am on the coming Monday. I am pleased to inform you that with reference to your interview dated 23rd Oct, 20__ at OBTC, you have been selected for the post of Senior Teacher on the following terms and conditions. 1. You will be on probation period of three (3) months from the date of joining. 2. During probation, you will also be given on job training. 3. Your performance will be evaluated during training and probation period. During probation period, on unsatisfactory performance, your appointment can be terminated without notice. 4. This is a contract appointment for period of two years which can be extended or reduced by mutual agreement. Detailed letter of appointment will be given to you at the time of joining the duty. 5. Your monthly salary will be $12,500 per month. 6. Company will deduct Rs. 2,500 per month from your salary during probationary period while this deduction will be reduced to Rs. 2,000 per month after successful completion of probation period. This deduction will be discontinued as soon as it reaches equivalent to two (2) months salary. 7. This security amount will be returned to you as per organizational policy, at the end of your employment. 8. You are supposed to arrange for your transportation. Organization offers transportation facility subject to availability with payment according to distance. If you agree to these terms and conditions, please report to join by 15.11.____. If you fail to join by the date, the job will be offered to candidate next on merit. Feel free to communicate for any further information. Confirm Meeting Appointment Letter Sample for business meetings, sales meetings, interview meetings, discussion meetings etc. I am writing to you to confirm that you have a business appointment on the 12.12.20XX at 10. The Street NR30 2LH Lowestoft Suffolk UK. With Mr. Jerold. This letter is to inform you that your request for an appointment has been accepted. Your meeting will be arranged tomorrow with the Owner of the company. Please come on the requested time otherwise you will miss the meeting. Thank you very much for requesting meeting appointment to discuss the issues faced by your company. Mr. James, CEO have nominated Ms. Areeba for this meeting as requested. We hope all of the issues will be resolved in the meeting. The meeting venue, date and time will be the same as said by you. I presented your letter to our president and he agreed for the meeting on agenda said in your request letter. Furthermore the time slot suggested by you is not convenient for us. We can be available on very next day at the same time. Please check this time slot for you and write back to confirm about the meeting. Otherwise we can have a new schedule for the meeting in case of your non availability on the next day. Looking for your response. Thank you very much for your reply and sparing time for meeting with us. I will reach with my colleagues (Mr. Hashim and Ms. Anum) at 11 AM for sales team meeting as suggested by you. We will also bring all the reports and documents for discussion. Again thanks for your time. I am pleased to write back with confirmation of meeting appointment with Marketing Team. I hope all the staff of marketing team will be present in the meeting with performance reports. Meeting agenda is enclosed with this letter and I request you to please distribute this agenda to all meeting participants. Hope to see you in the conference room for meeting on Tuesday at 11 AM. 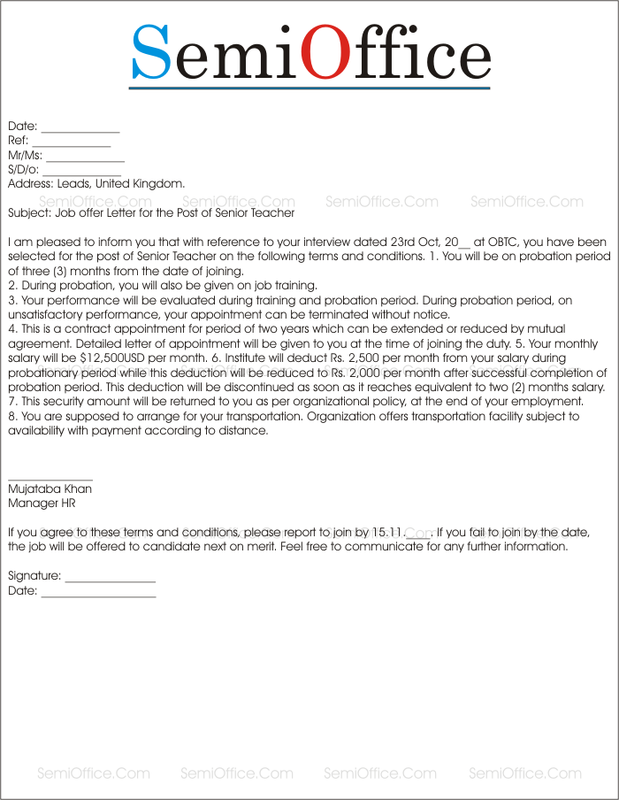 Sample Appointment Letter for Teacher Job from school free download. Format of teaching appointment letter is free and very good example for school, college and academy teachers. It is to inform you that on the basis of your education and other skills, our School has decided to appoint you as a teacher. Please confirm other details related to your job from the administration block of our School. This letter is written to you as an appointment letter for the job of our school. You have been selected as the teacher to our junior classes. You are requested to join as soon as possible. I am pleased to inform you about your selection and teaching job confirmation for the post of Assistant Teacher for Physics for A Level at LGS school with the effect from 13 April 20XX. All the terms and conditions with other benefits are mentioned on the attached employment agreement form. I congrats you and welcome you on behalf of all the teaching and administration staff of LGS School. Now you are the family member of LGS teaching staff and I hope that we together will work very hard to achieve the goals of our school. This is to notify for your appointment as English teacher from 18 July 20XX. We welcome you on behalf of our school, teachers and administration staff members at faculty of Beacon House School System. Please report to your section head Mrs. Tanzeela on 18th July with your original educational certificates. You are also requested to fill the enclosed employment biodata form required for this job and submit it to the HR Department. Your probation period is for three months starting from 18th July 20XX. After your probation you will be able to get all the benefits officer by school to its permanent faculty members. We wish you best of luck. With reference to your interview on 12th July 20XX. You are requested to join our school immediately as administrator and report to HR Department. All terms and conditions are enclosed with this appointment letter. We again congratulates you for your appointment on behalf of teaching and administration staff. Sample appointment letter for school teacher, principal, private school teacher, secondary school teacher in India, Pakistan, Europe, USA, UK, EU, UAE and middle east countries. Best letter of appointment for hiring teachers for school job at any position with salary and confirmation of job offer. 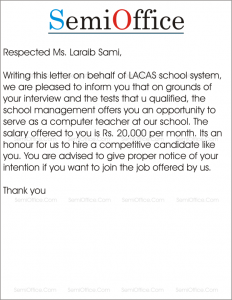 Writing this letter on behalf of OBTC School System, we are pleased to inform you that on grounds of your interview and the tests that you qualified, the school management offers you an opportunity to serve as a computer teacher at our school. The salary offered to you is Rs. 40,000 per month. Its an honor for us to hire a competitive candidate like you. You are advised to give proper notice of your intention if you want to join the job offered by us. On behalf of The Trust School, Sabzazar campus, we are hereby pleased to let you know that the School Management Committee is offering you an exciting opportunity to serve as a Junior School Teacher at our campus. You are selected on merit after conduction of your test, interview and demonstration. The monthly salary offered to you is PKR 17000/- with free pick and drop service. It is a best opportunity for you to work in a competitive and challenging environment and prove yourself as well as avail the chance of grooming yourself. 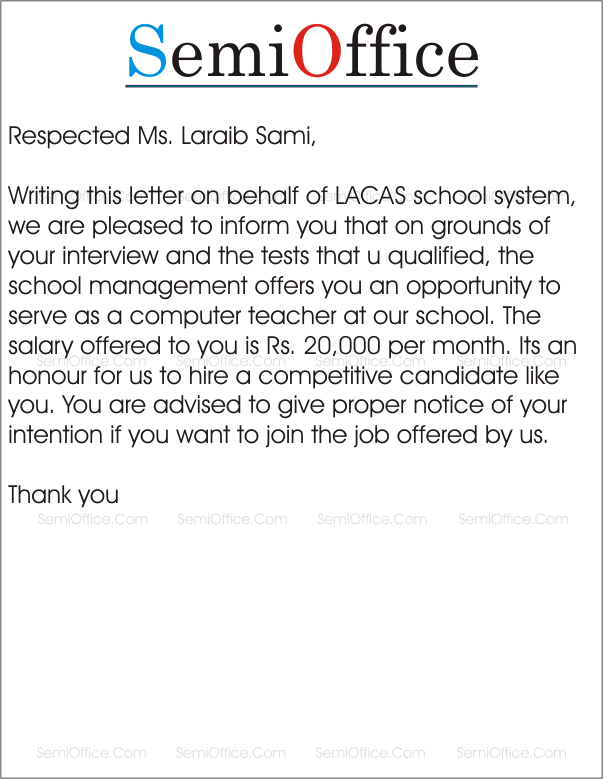 Appointment letter for School Teacher of any subject like computer, math, English, science, physics, chemistry, biology of any position like senior teacher, junior teacher, or principal etc. Format of request for job appointment letter issuance from the employer or the concern person in HR or HCM, Administration Department. Request for confirmation letter to HR. With due respect I would like to tell you that I have got a call from your HR team that after considering my CV I have been selected as a teacher for junior branch and I have to start working from Monday, but I have not received any confirmation letter from you as it is required for official purposes. I request you to send me a confirmation letter to avoid any inconvenience. I shall be really thankful to you. Thanks. 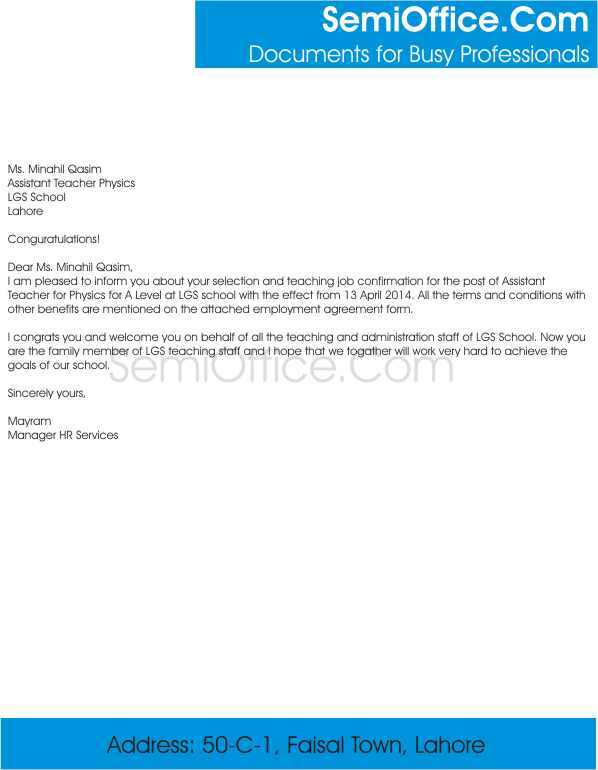 Dear Ms. Minahil, I am Maham working as marketing officer in the marketing department of AH Foundation, Lahore since October and at the time of hiring I has been told that my appointment letter would be issued with salary at end of month. I joined on October 1st and the month is over now. I request you to please issue my job appointment letter as marketing officer at AH Foundation for my records. Employment Contract Letter Sample for Teachers and Professors. This is also known as Job Contract Letter and it can be used for multiple training jobs in schools and offices. Pre-Selection Appointment Letter with terms and conditions. I am pleased to inform that you have been selected for 3 months training course. 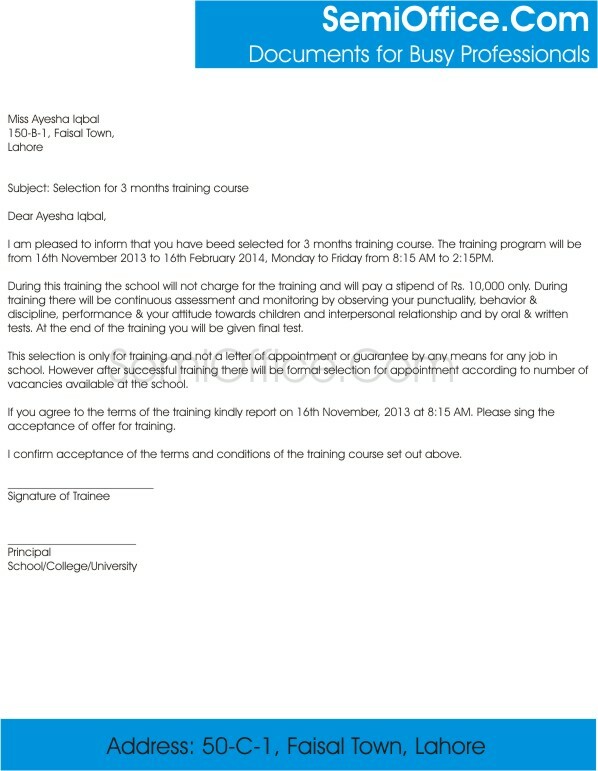 The training program will be from 16th November XXXX to 16th February XXXX, Monday to Friday from 8:15 AM to 2:15PM. During this training the school will not charge for the training and will pay a stipend of Rs. 10,000 only. During training there will be continuous assessment and monitoring by observing your punctuality, behavior & discipline, performance & your attitude towards children and interpersonal relationship and by oral & written tests. At the end of the training you will be given final test. This selection is only for training and not a letter of appointment or guarantee by any means for any job in school. However after successful training there will be formal selection for appointment according to number of vacancies available at the school. If you agree to the terms of the training kindly report on 16th November, XXXX at 8:15 AM. Please sign the acceptance of offer for training. I confirm acceptance of the terms and conditions of the training course set out above. Congratulations! you have been appointed as Assistant Professor on contractual basis for 2 years starting from 20th July XXXX. For first three months you will be on probation period and your performance will be checked time to time. Only in case to good performance you will be able to continue your job after the probation. After the contact expiry the employer can extend your contract period but it highly depends on your performance, employer and situation of that time. Again we congratulate you and welcome you to the university on behalf all teaching and administration staff. Sample Letter of Job Appointment for sales manager, accounts, management trainee or any other post. Sample Appointment Letter Template with Probation Period of 3 Months is available for free download. Letter is very simple which includes the name, date of appointment, terms and conditions for the position/job, monthly salary, allowance and other terms required for the job or by the company. Your probation period will be for three months starting from the date of your joining. However, this period can be cut short or extended based on the individual’s performance and at the discretion of the management. You will be entitled to travel reimbursement (@ Rs. 5/- per km) based on your actual traveling related to your assignment. You are not entitled to any leaves with pay during the probation period. You might be placed at any project as and when required by the management. Either party can nullify this contract by giving a notice of 20 days. After the probation period, you will be given a proper letter of appointment with terms and conditions for permanent employment. We are pleased to engage your services as Micro Credit Officer in the Bank. Following terms and conditions are applicable to your employment. Your employment will be governed by the rules and regulations to vague and altered/amended by the bank, from time to time. You will be acquired to serve at any Branch/Office of the bank at the discretion of the management. Your performance shall be subject to Quarterly review. this letter, duly signed to this office latest by September 5, 2017. In case of non-receipt of signed duplicate copy of this letter by the above mentioned date. It shall be presumed that you are not willing to join the Bank’s Service. Sample Appointment letter for marketing executive, manager, agent, officer, consultant and officer from the company to its employees. This appointment Letter includes terms and conditions for job and probation period of three months. You can customize this letter by changing the terms and conditions offered by your company, salary and duration of probation period of the employment. You will be entitled to travel reimbursement (@ $1. 3/- per km) based on your actual traveling related to your assignment. We are pleased to offer you employment in our company in the capacity of the Marketing Manager starting of employment on [Date]. You will be on probation for a period of Three months, which may be reduced or further extended at the sole direction of the organization. Your salary will be $6000/- per month inclusive of all benefits. Please sign on the duplicate copy of this letter as an evidence of your acceptance. We are pleased that you will be working with our office and look forward to your success. My signature indicates that I accept the position as Designation as described above.